Designed for skins with installed lines and wrinkles, prone to skin dryness and roughness. This fantastic serum gives a visible lifting effect, filling fine lines and wrinkles, through an infusing of intense moisture, and returns skin elasticity. Tougher and visibly rejuvenated skin! 3) Collagen protective factors, extracted from the microalgae Nannochloropsis oculata, protects the produced collagen depletion. Hyaluronic acid, improves skin's strength and density. Its low molecular weight and its small molecular size, eases penetration through the skin barrier, providing a fill lasting effect. Ocean-Matrix Complex, formulated with polysaccharides of botanical origin and red seaweed, Porphyridium cruentum, has an immediate and visible tightening effect. It also provides a remarkable effect of smoothing the skin, reducing roughness, and exerting a protective barrier effect against oxidative stress. Cellactel 2 Complex, cell regeneration complex which stimulates the vital functions and revitalizes skin cell metabolism to "lift" the skin and visibly reduce wrinkles. The result is a tough skin with a rejuvenated appearance. Apply morning and evening on face and neck, before Cell Shock Total-Lift, or another daily moisturizer. 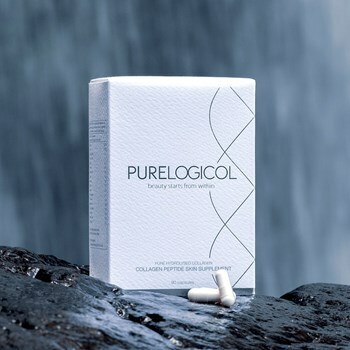 Did you know that collagen decreases 1,5% each year from the age of 25? It’s important to be disciplined about cleansing the skin to promote health and well being.